Obesity is an increasing health problem worldwide. Endoscopic therapies have emerged as treatment option in addition to lifestyle modification and bariatric surgery. One possible endoscopic approach is to reduce the size of the stomach  . This approach has been demonstrated to be feasible and efficient using different endoscopic suturing devices  . The GERDX device (G-Surg GmbH, Seeon-Seebruck, Germany) allows full-thickness suturing in the upper gastrointestinal tract and was originally used for endoscopic antireflux therapy . The transmural sutures have proven to be durable and to remain in situ even after long follow-up. In this 41-year old woman, who suffered from severe obesity (168 cm, 121 kg, body mass index [BMI] 42.9 kg/m2), we aimed to use the GERDX device to perform an endoscopic sleeve gastroplasty. The device was inserted into the stomach and an ultraslim endoscope was introduced through the device’s working channel to provide visualization. Next, the gastric wall was retracted with a tissue retractor and the full-thickness suture was applied. This was repeated 18 times from the fundus to the distal corpus ([Video 1]). This resulted in a markedly reduced stomach volume. Video 1 A new treatment option for obesity. Use of the GERDX device (G-Surg GmbH, Seeon-Seebruck, Germany) for application of transmural sutures in the stomach in order to perform endoscopic sleeve gastroplasty. The procedure was performed under general anesthesia and peri-interventional antibiotic therapy was initiated. 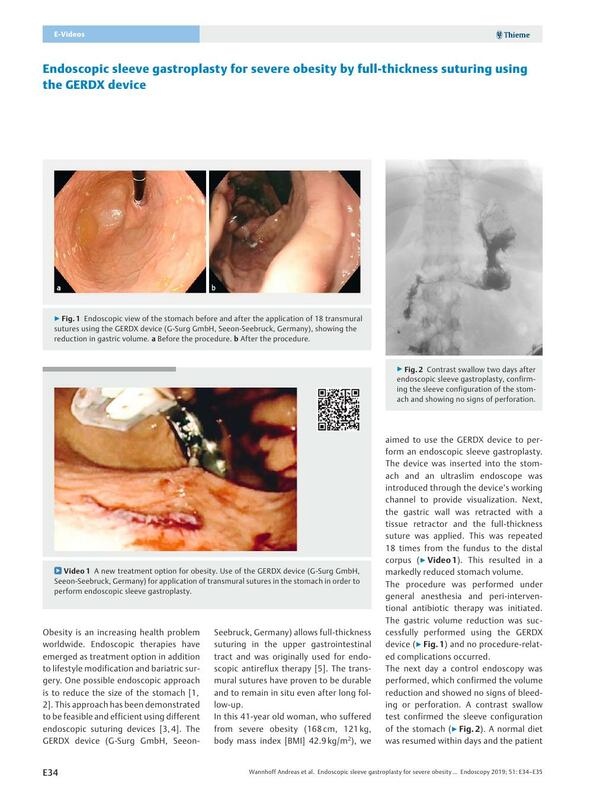 The gastric volume reduction was successfully performed using the GERDX device ([Fig. 1]) and no procedure-related complications occurred. Fig. 1 Endoscopic view of the stomach before and after the application of 18 transmural sutures using the GERDX device (G-Surg GmbH, Seeon-Seebruck, Germany), showing the reduction in gastric volume. a Before the procedure. b After the procedure. The next day a control endoscopy was performed, which confirmed the volume reduction and showed no signs of bleeding or perforation. 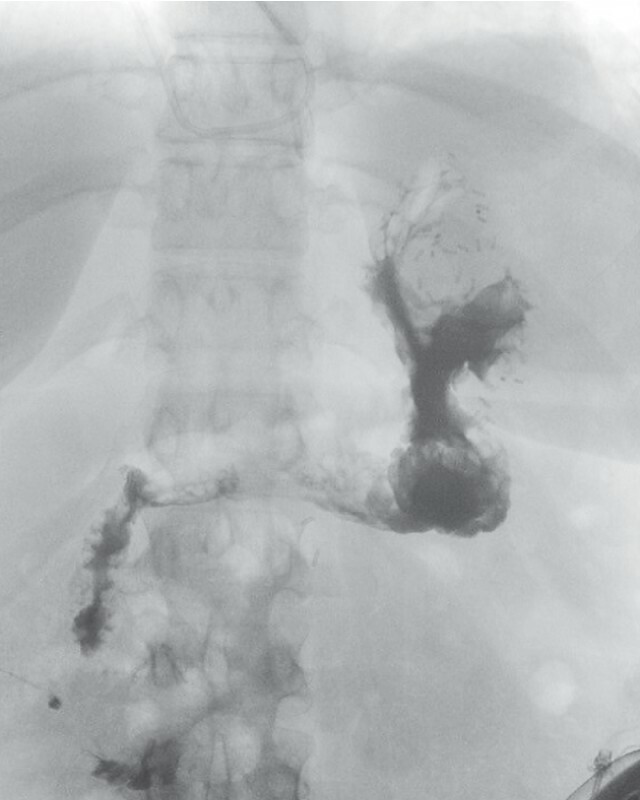 A contrast swallow test confirmed the sleeve configuration of the stomach ([Fig. 2]). A normal diet was resumed within days and the patient was discharged on Day 5 without any further complications. Fig. 2 Contrast swallow two days after endoscopic sleeve gastroplasty, confirming the sleeve configuration of the stomach and showing no signs of perforation. After 8 weeks, the patient had lost 12 kg of weight, resulting in a change in BMI of – 4.3 kg/m2 or a percent excess weight loss of 24.0 %. Endoscopic sleeve gastroplasty using the GERDX device was feasible, safe, and efficient in this patient. This technique could potentially emerge as a minimally invasive treatment for obesity.